In 1763, Benjamin Franklin wrote a letter to a colleague with an enclosed recipe for milk punch. His recipe called for brandy, citrus juice, water, and sugar combined with boiling milk, then strained of the milk’s solids–which can be stored indefinitely at room temperature. While our recipe replaces bourbon with brandy and doesn’t go through the steps to remove the solids, Ben’s recipe shows us that this thing has been around for a while. In a mixing glass three-quarters filled with ice, pour the bourbon, rum, milk or cream, vanilla and simple syrup. Shake vigorously until chilled, about 30 seconds. Strain into a rocks glass. Dust with nutmeg. **If you don’t feel like making simple syrup (and I never feel like making simple syrup), buy some here. Its cheap and will save you some time and mess. 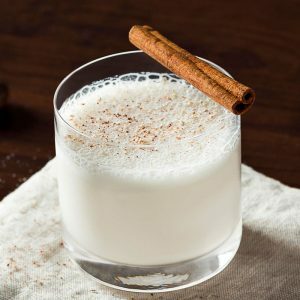 If you have experienced the joys of a milk punch, leave a review below. Feel free to shout out the bar that prepared it for you, or your own recipe!